You guys do realize that your are all aruguing over a pokemon trivia, right? You do realize that this is not a life changing event, right. It's not the end of the world if you do not participate in this tiny insignificant trivia about pogeymanz. O,great midnight for me thanks i cant compete cause its a school night. Dont talk about me like that ok.
Madman, don't overreact, she was joking abou the bilge rat story. Believe me, it seems to be over now, and it ended before I could get used to it. Seriously, read the thread, don't go making posts in topics without reading them first. Well trivia was a great success and blahblahblah, so here are the scores! 1 - Mr. MMJ, Riku, Nido, Frost, swift53... and me, because I stumped everyone with a question. 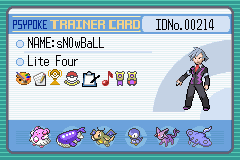 All these people will get trainer card participation ribbons, and the top three will get a special ribbon, if they do not already have one. [13:14:05] * @TonberryKing What kind of berry tree is behind Kurt's house? 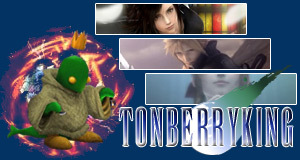 [13:52:49] * @TonberryKing What Ghost Attack comes first alphabetically? Prophet, ChroniclerC and tiger10x should have received a PM to confirm that I have changed their Trainer Cards to include the Psyquest Participation ribbon. 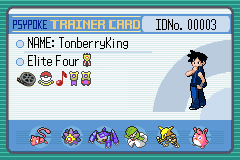 For the other winners, it'll take a little more time for your TCs to be updated, because (to make a long story short) the TC Maker doesn't have records of your present Trainer Card at the moment. If, however, you have never requested a Trainer Card, you will have to request for one in order to get the Ribbon. Questions?